Trekking Iran: It’s been a while that trekking, hiking and adventurous backpacking trips are becoming more and more attractive for Iranian and also foreign travelers and backpackers who visit Iran. The beautiful and undiscovered places, stunning landscapes and fascinating sights in Iran’s nature, the inhabitant’s ethnic group’s variety, and also the hospitality and culture of locals in small villages or nomadic parts which are suitable for trekking, make Iran a perfect destination for these sort of activities. Not only mountains, but a diverse range of flora, remote deserts with a diverse range of wildlife, and many more different environments, like wild barren mountains, huge forests and hidden waterfalls inside them can be an exciting choice for you as a trekker in Iran. Despite the fact that highest mountains in the region like Alborz and Zagros are located inside Iran as the major attractions for trekkers coming here, in general, beside the limitless opportunities for difficult, remote and technical spots to trek and climb, Iran can offer easier and more comfortable trekking routes than other countries in the region for trekkers who are not looking for just super serious activities. In most of the trekking cases in Iran, it doesn’t make a big difference if you’re not a professional mountaineer and explorer. But your Iranian guide definitely can make a change. So, be peaky about choosing it. The Valley of the Assassins is located in the great Alborz Mountains which is raised up from the Caspian Sea. This trekking destination will provide you a more quiet, green and traditional side of Iran. 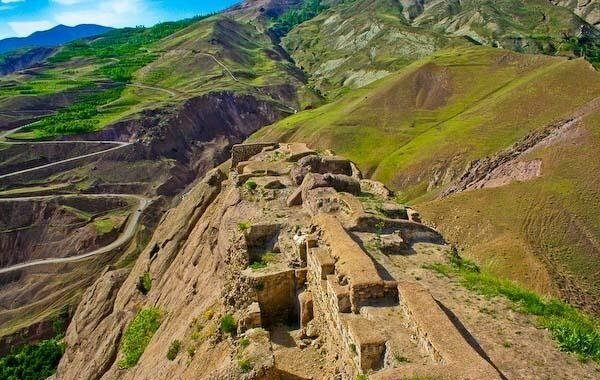 For start, you have to travel to Alamut. Normally the trekkers visit the impressive Roodkhan Castle and the beautiful and traditional village of Masule (Read more about this lateral village on our blog post Masouleh Village. Through this route you will experience stunning mountain landscapes and if lucky on time, you may pass the nomadic Shahsavan, pastoralists. If you’re not tight on time and eager to complete you journey in North-West of Iran, just drive along the Azerbaijan border to reach Jolfa and visit its Armenian monastery and at the end, go to the great city of Tabriz with its worldwide famous traditional bazaar and blue mosque. Jolfa and Tabriz bazaar are both among UNESCO World Heritage Sites. Through this trekking route, we suggest you to: Visit old Caravanserais on the way; Visit Lambesar Castle, relax around Ovan Lake & village and have the most mesmerizing landscapes for nature photography from Andej canyon ”Red-Rock”; Visit the ruins of the Alamut historic castle “Eagle Nest”, Visit rice and tea farms near Masouleh and again, if you have time, definitely go explore the city of Rasht. To reach the highest mountain in the region at its 5671 meter volcano, you need four days or more depending on which side you plan to hike. To start, the base camp is two hours from Tehran. This camp make Damavand one of the most accessible 5,000-metre-plus mountains in the world. For experiencing Alborz, you don’t necessarily have to go for the Damavand summit, especially when you’re not up to a professional climb or just want to have a normal trekking. When it comes to Alborz Mountains, you have a wide range of options to choose from: Hiking in Lar national park, the ring of Damavand and hiking in Talesh Mountains can be great alternative options for you. If you already have your plans for Alborz Mountains you will pass through Lar National Park. This region is a great protected area because of its diverse fauna and flora. And most of the famous photographers have captured their best shots from the great Damavand and its landscapes from this spot. To start, you have to go to Garmabdar at north of Tehran. Then, after 4 hours of hiking you will reach Lar Plain. Through the way, besides meeting nomadic people who stay in this region for the summer, you might get a chance to see some wildlife such as wild goat, wild sheep, vipers, eagles and etc. Then, you will walk through the northern ridge of Mt. Damavand to access the Nandal, the north-eastern plain. You can have a 4-6 days of trekking in this area and then proceed to Damavand peak if you’re a professional hiker. That’s totally another story. Damavand as the highest mountain in Iran and west Asia is the natural icon of Iran. It can be said that Iranians look up to Damavand as one of their national icons and heritage, since it has a special place in the Persian ancient and modern literature and mythology. If you don’t want to climb Damavand peak, this giant white volcano, go for a trek in the ring of it. For that, you can start from southern face of Mt. Damavand (2600 m above sea level), then trek to the west and then Daq Plain at the north west ridge (3600 m above sea level). You can finish your trekking in the Nandal village and its Eco Camp. Usually a 4-6 days of trekking in this area is the most efficient duration. Trekking from Neor Lake to Subatan Highlands can be the dreamiest trekking of your life. The evergreen landscapes are exactly what you need to break the cliché of Iran and its deserts. Talesh Mountains with its sub-tropical climate, are at the northwest of Alborz along the south western coast of the Caspian Sea, a misty green area full of meadows and lush Hyrcanian forest in Gilan province. It is said that Talesh is where the Aryan People first settled and also the birth place of Zoroaster, the prophet of the ancient Persian religion, Zoroastrianism. To trek this route you have to pass through the mountains from west to east. Along the way, there is the beautiful heavenly Neor. Meeting local nomads in the tents or wooden structures along with local huts and farmlands will be the highlights of your journey for sure. Usually a 4-6 days of trekking in this area is the most efficient duration. trekking Neor to Subatan is 20km. Best time to trek this region is in May & June. If you’re interested in misty mountains and the sound of woods and birds in the nature, Javaherdasht will be a nice choice. The calmness you’re going to experience, is beyond your expectations. This region is located in eastern Gilan, between Kelachay and Chaboksar cities, on Siahkalroud road. To reach the perfect starting point you have to ride about 20 Km (30 minute) through paved road and then about another 20 Km (1 hour) drive through mountainous dirt road in the middle of the jungle. Having a Jeep ride in this route is also one of the suggestions that will make you fall in love with it. Your trek can be a 2 -4 days of hiking and trekking depends on your schedule.